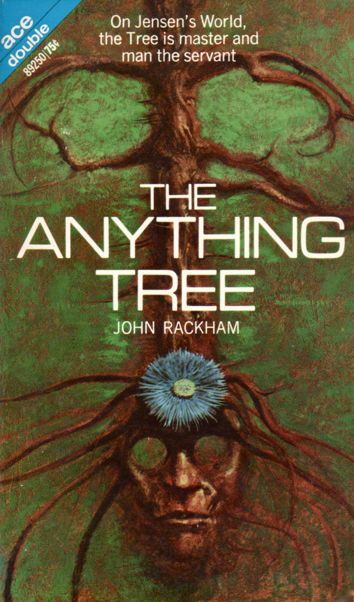 After buying the Ace Double book to get a copy of The Winds of Darkover to add to my collection, it seemed silly not to flip the book over and read the other novel, The Anything Tree by John Rackham. It was a frivolous read … classic patriarchal science fiction that contained a few neat ideas to offset the things that annoy me so much about much of the pulp fiction written during that era. The Anything Tree begins with our heroine, the beautiful and brilliant Selena Ash, discovering that her small space cruiser has been sabotaged. This alerts her that someone knows she is not just the empty-headed social butterfly and daughter of a wealthy, powerful intergalactic businessman she’s been pretending to be! After being thrown off course and deftly disabling the bomb intended to destroy her, Selena manages to land on a nearby planet so that the real adventures can begin. On this unknown, uncharted planet, she meets Joe, a man who claims to have been stranded and living on the planet for a few years. He has “gone native” and his companion is a seemingly sentient blue flowered plant named Friendly. Since this was written in the 70s, there has to be a scene where the heroine’s clothing gets destroyed and her voluptuous beauty is briefly revealed, there has to be evil and ugly villains who meet tragic ends and of course there has to be the usual smattering of cool technology and societal advancements for us to dream about. Finally, the girl must realize that she would rather stay in the middle of nowhere with the hero, who faces an impossible challenge but is true to himself, rather than go back to being a spy on her own. Can you tell there were things that bothered me about this novel? While there were some interesting ethical questions and one plot twist that caught me completely by surprise, the fact remains that this story seemed so weak in comparison to the rich, intricate offering that Marion Zimmer Bradley was able to accomplish with just 25 more pages of text in the same Double book. When I looked John Rackham up on Wikipedia, I felt as if I’d read one or two of his other novels in my teens and certainly quite a few of his short stories in Analog magazine. The overall impression that I have, from reading The Anything Tree, is that his work is too formulaic and patriarchal to ever capture more than a passing glance from me. Paperback format, 114 pages, published in 1970 by ACE Books.